As revealed in that leaked Sprint roadmap from last month, Sanyo's Katana Eclipse and the RAZR VE20 become real phones today. The Eclipse is replacing the DLX, and it's headline gimmick feature is that the sides light up, rave style. 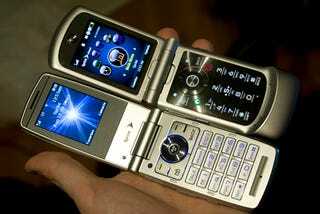 And the VE20 is an, um, RAZR, but slightly less loathsome than usual. They've both got 3G, Sprint's usual lineup of GPS Navigation, TV, Music Store, Email (which is inexplicably light years ahead of Verizon or AT&T's clients and fairly usable if you can do the T9 thing), etc. The VE20's big feature is the NFL Live package, which has live streaming audio of every game, and in November, video of eight NFL network games. Of the two, the VE20 wins because the UI and screen are much nicer, and they're both $99 with two-year contract and rebates. But overall these are pretty standard consumer-y flip phones, nothing that'll surprise you.